Quality coffee and matcha lattes in the ‘burbs?! Yes indeed, both have been available in Point Cook for the last 8 months thanks to the folks at cafe Bean Smuggler. But they do more than just deliver your caffeine fix, serving up quite the exciting brunch fare. Many of their dishes feature tasty, left-of-field tweaks that set them apart and places them a cut above many of the other same old same old brunch offerings in Melbourne. The flavours captured in the hubby’s smoky chicken sandwich were sensationally amplified thanks to the smoky rub, chilli mayo and fragrant fried shallots. The cherry on top was the fresh crunch from the toasted sourdough. 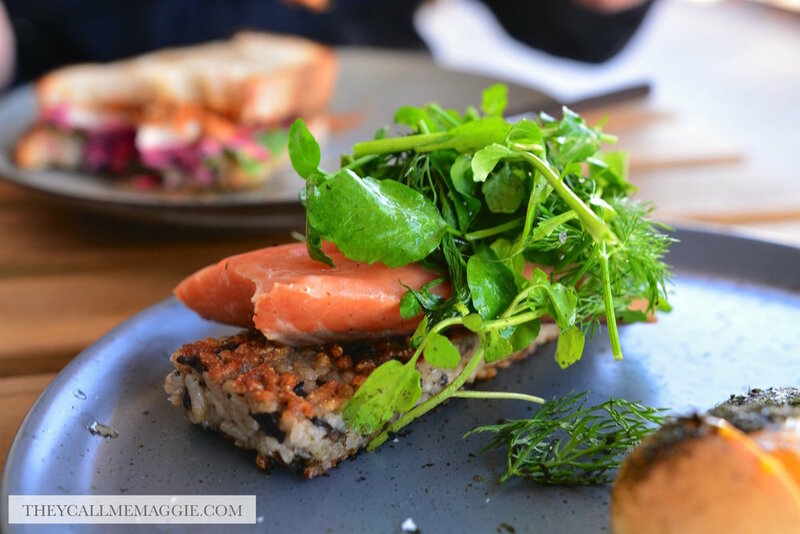 The miso cured salmon transported my taste buds to both Italy and Japan, with the pan fried mushroom risotto pattie, umami presence in the miso and nori, and zesty yuzu. The slow cooked salmon was perfection: gorgeously melt-in-the-mouth light and silky. If you’re not one for ordering a sweet dish for brunch, you’ll definitely want to make room for the sweet potato waffle as dessert. The waffles were well balanced in flavour and sweetness but it was the accompanying cocoa & almond crumb and the punchy raspberry cream cheese that made this dish an absolute standout with their moreish flavour profiles. A testament and compliment to the quality of the dishes, the hubby has already declared that he’ll be returning with his mum some time; his usual response after a brunch meal is, ‘it was okay’. Luckily for us, Point Cook is only one suburb away from his mum’s. Smoky chicken sandwich - slow cooked chicken breast with smoky rub, lettuce, beetroot coleslaw, chilli mayo, fried shallots, and sourdough. Miso cured salmon - slow cooked miso cured salmon, with crispy mushroom risotto, herb mayo, smoked egg, nori powder, and herb salad with yuzu dressing. Sweet potato waffle - Belgian style waffle with sweet potato, maple syrup, fresh fruits, cocoa & almond soil, and raspberry cream cheese. Disclosure: I dined as a guest of Bean Smuggler. All opinions expressed in this post are based entirely on my experience and observations made during the time of my visit.